Most butterflies and many other insects can see ultraviolet, a color that is invisible to human eyes. Many flowers and butterfly wings include ultraviolet in their color mix. Within a species, the presence or absence of these markings typically helps to differentiate between males and females. Adult butterflies pollinate many different plant species, and many flowers have specific adaptations for attracting them. Many butterfly attractors bear dense clusters of small flowers that enable the butterfly to sip nectar simply by moving its proboscis from one blossom to another. Such flowers allow the butterfly to conserve energy while feeding. Female butterflies usually are bigger and live longer than male butterflies. 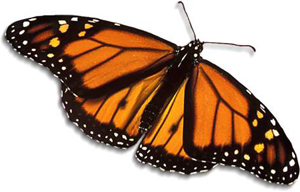 A butterfly has compound eyes: each eye is made up of about 6,000 tiny parts called lenses, which let in light. The blooms that we enjoy with our eyes and noses are also the beacons, landing platforms and launching pads for pollinators. In the process, insects get dusted with pollen, which they carry to other flowers. This, in turn, helps the plants produce seed and reproduce.